Drop-off areas are located directly outside the terminal building at departures level. So, you can pull up right outside, where you can touch down just long enough to unload luggage. 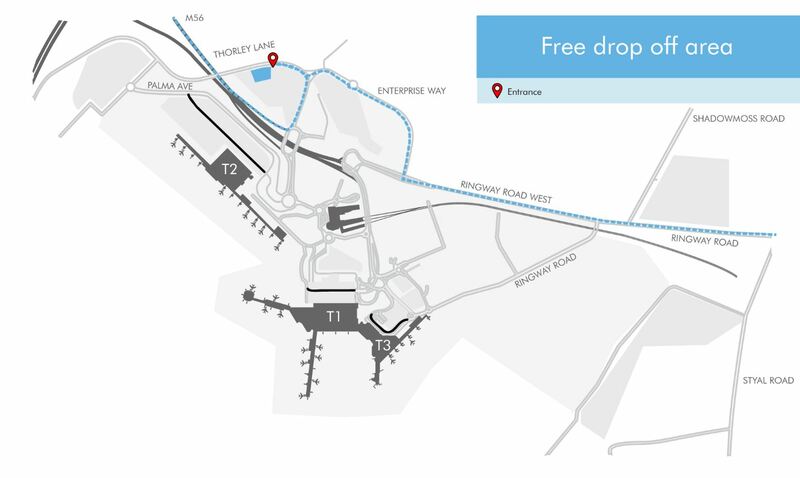 All passengers can use our free drop off area, from which a shuttle bus will transport you free of charge to your terminal. Alternatively, you can choose to be dropped off directly outside the terminals and train station. The charge for this is £3 for five minutes and £4 for 10 minutes and is payable at the exit barrier. Please note, a “10 minutes - no return within 30 minutes” restriction is in operation. Please do not exceed 10 minutes or re-enter any of the drop-off areas for at least 30 minutes, to avoid an automatic £25 re-circulation fee. Should you need to return within the restricted period for any reason, we recommend use of the pick-up area. Tariffs and Terms and Conditions are available at entry to each drop off location. There are different parking options available depending on which terminal you’re visiting. Multi-Storey car parks are available at all three terminals, or you can head straight to the arrivals car park if you’re picking someone up from Terminal 1 or 3. The changes that have been introduced only impact those dropping-off. The process for picking-up passengers remains the same – passengers can be picked-up in the arrivals car parks and multi-storey car parks with a charge of £4 for 30 minutes. We will have staff on hand to direct those dropping-off and picking-up to the right places. It isn't possible to pick up outside the train station; the Terminal 1 Arrivals car park is just a few minutes' walk away and should be used instead. 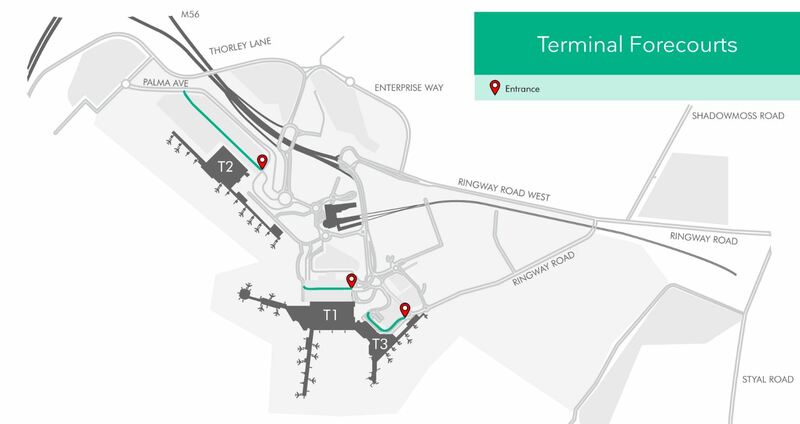 From 1st April 2019, the location of the Terminal 2 Arrivals car park, i.e the area to pick up customers flying into Manchester, will move to a new car park called T2 Multi Storey West. Please follow signs for ‘P T2 West’ which can be found on the road network surrounding the airport. See updated directions below. Leave the M56 at Junction 5 and follow the signs for Terminal 1. You will see the Hilton Hotel, followed quickly by the Clayton Hotel, on your left-hand side. Take the ramp to the left and enter the car park under the 'Drop Off' sign on the left-hand side. If you're picking somebody up from Terminal 2, we suggest using our Multi-Storey car park, conveniently located right next to the terminal. From 1st April 2019, the location of the Terminal 2 Arrivals car park (i.e the area to pick up customers flying into Manchester) will move to a new car park called T2 Multi Storey West. Please follow signs for 'P T2 West Pick Up Zone' which can be found on the road network surrounding the airport. If you'll be picking up customers before the changes begin, you can view the location of the old and new pick up zones here. Customers landing at Manchester should follow signs for ‘Pick Up Zone’ to reunite with friends, family and private hire companies collecting them. Follow the signposts for Terminals 1 and 3. You will see the Hilton Hotel, followed quickly by Clayton Hotel, on your left-hand side. Shortly afterwards you will reach a roundabout. Take the first exit at this roundabout. At the next (mini) roundabout, take the third exit. Continue until you reach a second mini roundabout. At the roundabout take the second exit, the 'Drop Off' area is located in front of the terminal straight ahead. Exit the M56 at Junction 5.